Want To Sew A Straight Line? There’s A Special Foot For That! Home/Sewing Machines/Want To Sew A Straight Line? There’s A Special Foot For That! Did you know that one of the simplest and essential skills you need for working with sewing machines is often one of the most challenging ones? Chances are you know this if you’ve ever struggled to stitch a straight line. So what can you do about it? Avoid unsightly, wavy stitch lines in your projects by using a helpful presser foot designed to make sewing straight lines with Janome sewing machines like the Janome 7318 sew easy! The quarter-inch presser or quilter’s foot is made to sew a ¼-inch seam such as those used for piecing quilt tops. The foot has a guide edge set exactly ¼ of an inch from the needle that is used to align the fabric as it’s being stitched. Available for all sewing machines, this foot simplifies sewing a straight line as you only need to keep the fabric edge sliding along the inside of the guide. -inch, the quarter-inch presser foot is a favorite attachment for making easy, straight stitch lines. Another presser foot used in quilting that is also a great accessory for general straight-line stitching on Janome sewing machines is the ditch quilting foot. Stitching-in-the-ditch, a common practice used by quilters, involves sewing just inside of a previously sewn seam. Because the stitching must be done precisely for the desired results, this presser foot is made with a metal guide that fits right into the “ditch” of the seam to guide the needle. The ditch quilting foot is useful for sewing straight lines when you want to reinforce a seam or add some minimalist topstitching. If you want both options, you can either purchase them separately or buy a clear-view quilting foot and guide set. This adjustable presser foot set is constructed from clear plastic and made with various guide settings. You can adjust it in various ways to do straight seam and topstitching with ease. An edge guide presser foot is very similar to the ¼-inch foot in design except that it’s somewhat adjustable. The foot has a guide flange on the right-hand side of the needle that can be screwed in or out to the seam size you need. Once adjusted, you can stitch keeping the edge of the fabric sliding along the inside of the guide.  inches from the needle. The border guide presser foot takes the challenge out of making multiple rows of border or decorative stitches with a Janome 7318 while also keeping them straight. This foot includes a clear, graduated guide plate that floats just over the fabric and allows you to keep subsequent lines of decorative stitches perfectly aligned. The marked stitch guides extend on both the right and left of the needle so the stitches can be aligned to anything from a previously sewn line of stitching to some other element in the fabric or pattern. So before you pull your hair out in frustration from all the wavy lines you’ve been making, reach for one of these presser feet designed for easy straight stitching with sewing machines like the Janome 7318. 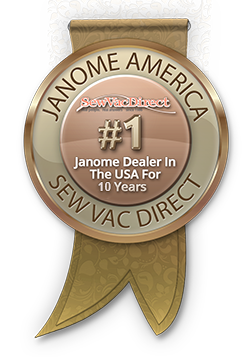 You’ll be much happier with the results you get working with Janome sewing machines!